Wyoming is home to the headwaters to the Mississippi, the Columbia and the Colorado rivers in its western mountains. Wind River Country lies along the edge of these magnificent water resources and has more than 2,000 miles of rivers and streams and 626 lakes and reservoirs. There are more than a few places to pay in the water. Wind River Country’s reservoirs and lakes provide miles of shoreline and acres of open open water to explore in a boat, kayak or canoe. The area’s largest reservoir—Boysen—is popular for motorboats, water skiing, jet skis and houseboats. 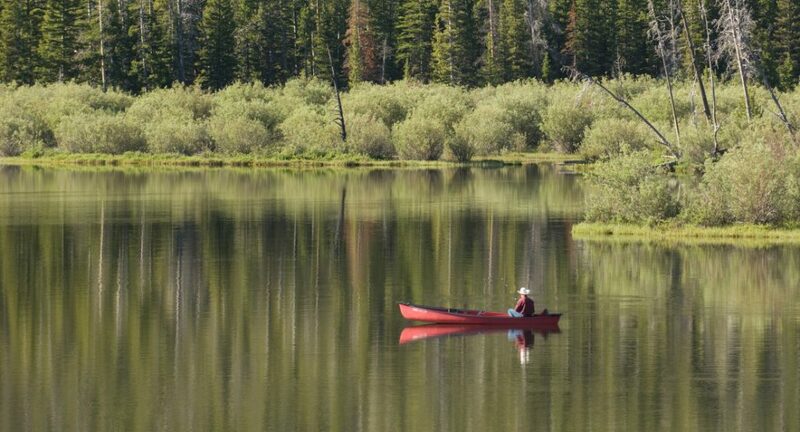 Smaller lakes, such as Ocean lake, Louis Lake or Worthen Reservoir, offer more protected water canoeing and kayaking. If you are looking for a day of water skiing, tubing, riding jet skis, visit Boysen Reservoir, which rises like an oasis out of the arid landscape between Riverton and Shoshoni. There are several small public beaches, plenty of camping and when it’s full, there are 19,000 square acres of lake on which you can play. There is also a marina, with boat rentals and supplies, and Boysen State Park. 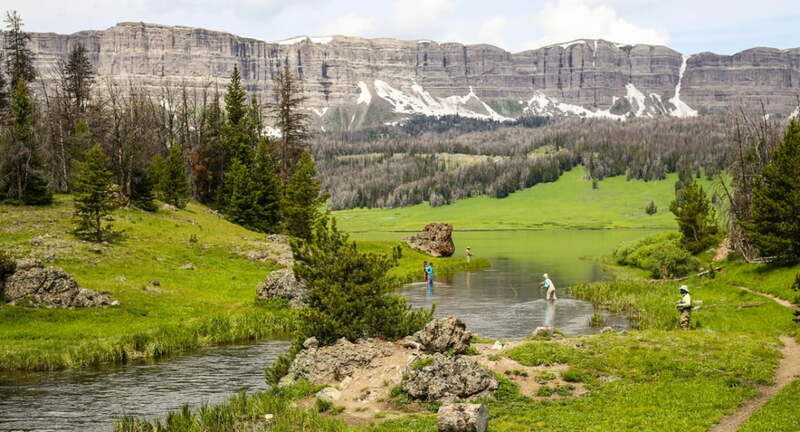 Traveling the Loop Road, also called the Louis Lake Road, is a scenic drive in the Shoshone National Forest on a part-rough dirt road, part-paved road, that also takes you by several subalpine lakes with excellent fishing and superb views. Louis Lake, for which the road is named, is a perfect place for canoeing or kayaking and with a lodge located near the shore you can rent a cabin and a canoe. If you opt to keep going, stop at Worthen Meadows Reservoir. There are campsites, picnic tables, cook grates and a boat ramp. Worthen Meadows also is home to the start of several trails that will lead you on popular hikes into the Wind River Mountains. Every year volunteers collect live discarded Christmas trees and leave them on the ice to sink. The trees create ideal fish habitat, so if you are visiting Ocean Lake, bring your gear (and fishing license). Ocean Lake is also home to some beautifully preserved bird habitat, so keep an eye on the shore to spot the birds of the season. If you head up Togwotee Pass, near Dubois, you won’t be able to miss the towering cliffs and pinnacles that make up the skyline. But the images always seem fleeting and to disappear too quickly for me. Take in the dramatic skyline for a little while longer with a visit to Brooks Lake onTogwotee Pass. There you can launch your canoe and stare up at the volcanic ash cliffs and create such memories that when you think back on your trip to Wind River country, you’ll think of water. The Wind River Canyon is a stunning, uncrowded stretch of water, with peaceful drifting and thrilling whitewater. This section of the Wind River winds through part of Wind River Indian Reservation. The only way to go down river in the canyon is with a Native American guide service, which means you’ll likely only see one or two other boats at most—owned by the only company operating in the canyon. You won’t find that kind of rafting experience anywhere else in Wyoming. Wind River Canyon Whitewater & Fly Fishing is a Native American-owned business based in Thermopolis. Guiding the canyon for 20 years, they offer a variety of rafting trip options. The first time I drove Wind River Canyon was a struggle. I had to fight to keep my eyes on the road and not stare at the stunning rock faces on one side and the river on the other. Each subsequent trip through I took in a little more of the scenery as my eyes flashed away from the road and back, but I didn’t really get to appreciate it until I took a rafting trip through the canyon. A whitewater rafting trip through Wind River Canyon brings together all the things that make this area special. The ancient canyon is carved by the Wind River and offers a unique blend of stunning scenery and adventure. There is one company that runs whitewater down the river. Wind River Canyon Whitewater and Fly Fishing is a Native American-owned business based in Thermopolis. The breathtaking stretches of river their trips feature are part of the Wind River Indian Reservation. The only way to go down the stretch of river in the canyon is with this guide service, which means you’ll likely only see one or two other boats at most – owned by the same company – when you are on the water. You won’t find that anywhere else in Wyoming. The family-owned rafting company has been guiding the canyon for 20 years and offers different trip options. The upper canyon has fewer, but bigger rapids. And the lower canyon provides more, but smaller waves. Both you can experience in a half-day trip. If you want to see it all, the full-day trip combines both and includes lunch at their teepee site. No matter which trip you pick you’ll have a chance to really take in the canyon. I was finally able to tilt my head back and stare, mouth agape up at the 2,500-foot walls and some of the oldest exposed geological formations in the United States. It was as beautiful as I’d thought from the glimpses I’d gathered while driving, and seeing the canyon walls from the river put the size of it into scale. Rich in geological history and home to wildlife, like bighorn sheep and a variety of waterfowl, there’s plenty to see. But eventually I had to snap back to reality from my scenery gazing because we were about to hit the whitewater. Cut through the Owl Creek Mountains the Wind River Canyon offers class three and a few class four rapids that can, in extreme conditions, become class five. Mostly the river stays at class three to four on the whitewater classification system, big enough to get you wet and your heart racing, but not so big to incite true terror for your life. Still the transition from the tranquil stretch at the beginning seems as though the river has suddenly been unleashed as it churns through the canyon. Some of the state’s best stretches of whitewater are in the canyon with a series of rapids with names like 1st Damn Rapid, The Tunnels, Sharpnose, Sphincter, Freight Train and Washakie Falls. The river is also home to great fishing and the company runs fishing trips. You’ll need a tribal fishing permit, but you can buy it at the company’s office in Thermopolis. No matter which you choose you are in for an adventure unique to Wind River Country. Other places might have whitewater rafting, but no one combines it with a place like the Wind River Canyon.